It’s that time again, another chapter of Brightest Day hit the stands today, so let’s get into it. In issue #3, “Revelations,” we watch as Deadman is forced into a confrontation with the Anti-Monitor that yields some surprising results, and yet again teases some of what’s really going on with the White Lantern. The title is a little misleading, nothing is actually “revealed” in this issue, but we are given a few more pieces of more than one puzzle. Deadman is just the tip of the iceberg. 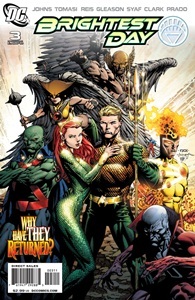 We also see the now-separated Ronnie Raymond and Jason Rusch refusing to associate with one another (which may be the best, considering what happened the last time they formed Firestorm), Aquaman and Mera continue to delve into the mystery of why he’s gained the ability to control dead sea life, the Martian Manhunter continues to investigate the revelation that he may not have been the only Martian brought to Earth way back in his origin story, and Hawkman and Hawkgirl find out that their old foe Hath-Set was after more than just the bones of their original bodies. The book does feel like it’s moving along rather slowly, which is often a symptom of having no less than five storylines going on at any given moment. The real issue I’m having is that it feels some of them are getting a little neglected. The Aquaman and Martian Manhunter stories have only moved forward incrementally since this series started, and while we’ve definitely gotten forward movement with Firestorm and the Hawks, it’s come in small chunks. It’s really quite a relief that half of the 12 characters who came back in Blackest Night are having their stories told in other titles, I can’t imagine how short each segment would be if they were all in this title. Geoff Johns and Peter Tomasi need to pick it up a little, possibly by tying the different stories together. Deadman is getting the most motion, and that’s okay with me. He’s really become the main protagonist for this event, the one the others are kind of revolving around, and the one whose story I believe will probably bring the most revelations. He’s also the one who has the most adjusting to do. Sure, they’ve all returned from the dead, but he lived a whole life when he was dead. It’s quite the change, and it’s working. Again, we have a lost of artists contributing to this issue. Each one, fortunately, is handling a different storyline, so it’s not quite as jarring as it may otherwise be. The only real issue I have with the art is a continuity complaint, but it’s a big one. I realize that not everybody out there may have read the last Firestorm series, but am I the only one who remembers that Jason Rusch’s father only has one hand? That’s kind of a big thing to miss. Not a bad issue, but I hope the book speeds up.